Originally published in September 2009 in the Community Arts Perspectives Journal on the Community Arts Network. In June 2007, I joined Voices from the Cultural Battlefront: Organizing for Equity, the 20-year international conversation about the role of art and culture in the struggle for social justice, human rights and a sustainable natural environment. I was 22 years old and had just graduated from New York University’s Tisch School of the Arts. At arts school, I was encouraged to abandon my cultural heritage in order to become more marketable. Upon serendipitously meeting up with Voices participants, I was struck by the way they brought a consciousness of cultural identity and tradition to their art making and justice seeking. That June, after a hiatus, Voices had just been re-convened by two of its leaders, Marta Moreno Vega (Caribbean Cultural Center African Diaspora Institute) and Dudley Cocke (Roadside Theater/Appalshop). The occasion was the 30th anniversary of the Caribbean Cultural Center, which chose to celebrate not only its own longevity but also that of other cultural institutions founded by leaders who began their activist work during the civil rights movement. As Vega declared, “It’s time to reunite the family,” which included veterans Kalamu ya Salaam, Sonia BasSheva Mañjon, Bernice Johnson Reagon, Amalia Mesa-Bains, Tonya Gonnella Frichner, Peter Pennekamp, Caron Atlas, Olga Garay and Jack (John Kuo Wei) Tchen. As articulated by Vega, the questions informing the June 2007 conference at my alma mater were: What do culturally grounded organizations that have reached their 30th anniversary have to celebrate? How can their work be sustained? This dramatic move to privatize all and subject all rewards to the marketplace is a return to “the survival of the fittest” ideology of elites…. Such a false system of survival “merit" serves to promote massive individual alienation and social fragmentation. It destroys what we have left of a public commons — a shared, inclusive space not privileging private wealth and power over basic human rights and values (Tchen). In the early 1990s, the Voices conversations were infused with the prospect of cultural democracy, deriving energy from successive social movements — civil rights, antiwar, women’s and gays and lesbians. In 1993, the seminal publication of Voices leaders, “Voices from the Battlefront: Achieving Cultural Equity” (Africa World Press), boldly posited that just as the color line was a defining issue of the 20th century (as predicted by W.E.B. Du Bois), the struggle for cultural equity would be a defining issue of the 21st century. Several years after the book’s publication, the coalition’s energy and resources were sapped, thanks to 15 years of relentless right-wing attacks on cultural pluralism. Tchen’s economic analysis generated some clarity about why the coalition had gone into hiatus. There was consensus that the Reagan administration's policy of trickle-down economics based on unregulated free-market capitalism inaugurated the present era of hardship for nonprofit arts organizations serving poor, working and middle-class communities. The culture wars, also initiated by the Reagan administration, employed a strategy of divide and conquer. At the June meeting, Voices leaders asked themselves: How do we who serve the cultural interests of the majority of Americans find ourselves relegated to minority status? Did we contribute to our marginalization and, if so, how? The conference’s discourse uncovered partial answers to these questions: As a field, we had allowed ourselves to become fragmented and distanced from each other, consistently failing to rally around our common interests. As Mesa-Bains stated, “It is a story of overlapping struggles, of people separated by the very enemy that they have in common, because that enemy finds a way to define them in different terms, in a way that they have no common terms.” As a multicultural coalition, Voices had lost the critical discourse and analysis that its coalition members relied on to build and sharpen each other, which, in turn, inspired internal unity and provided a significant critique of national policy. With new clarity, Voices leaders committed to organizing a series of national forums using Tchen’s analysis as a gateway to discussion. With only a shoe-string budget, each forum was conceived to piggy-back on other national conferences: in New Orleans, La., on December 6-7, 2007, as part of the National Performance Network’s national conference; April 4-5, 2008, in Amherst, Mass., at New WORLD Theater’s Intersection conference; August 5-10, 2008 in Arden, N.C., as part of the Alternate ROOTS 32nd Annual Meeting; in Los Angeles, Calif., October 1-2, 2008, during the Imagining America: Artists and Scholars in Public Life national conference; in Memphis, Tenn. on February 21, 2009, at the Folk Alliance International Conference; April 19-21, 2009, in Monterey Bay, Calif., sponsored by the Community Arts Convening and Research Project; and August 11-15, 2009, in Arden, N.C., as part of the Alternate ROOTS 33rd Annual Meeting. Each forum began by clarifying terms. “Culture” was defined as the distinctive spiritual, intellectual, emotional and material traditions and features of a people, and “equitable” defined as meaning fair and just. As a matter of principle, then, all cultures had the inherent right to develop, expecting fair and just treatment in relationship to all other cultures. Then, drawing on Tchen’s analysis, forum facilitators asked participants to consider the proposition that there now exists a form of hyper-capitalism that puts the demands of the free market before a people’s spiritual, intellectual and emotional well-being. Borrowing scholar Karl Polyani’s analysis in his 1944 book, “The Great Transformation: The Political and Economic Origins of our Time,” facilitators postulated that when any society, whether pre-industrial, industrial or post-industrial, embeds itself in economy, rather than the economy being embedded in the society, social decay ensues. Was unregulated “free-market” capitalism, which puts profit before people, destroying communities globally? When I arrived in Nashville in 1987, it was a relatively innocent place. Country music was not for making profit. During the recent presidential campaign, Sarah Palin used one of my songs, “Independence Day,” completely ignoring its context of domestic abuse. I had no legal recourse, so I donated the song royalties during the election cycle to Planned Parenthood. As a consequence, I got a lot of hate mail that said, “Country music is conservative, you just lost a lot of fans, and you’re going to pay.” Worst of all, in my community of artists, Music Row, no one publicly supported me. The most shocking thing is, we’ll play in a high school in Fort Smith, Arkansas, and we’ll bring in our folk instruments and we’ll hold up a banjo and ask, “What’s this?” Literally only one student will know. My husband and I were family farmers in Minnesota, and we washed out in the mid-‘80s, when family farmers went down the tubes. We auctioned off our livelihoods and started over in Nashville because of a love of music. We started a house concert series. We have potluck. We have community. Last year at this conference, we went to a panel on house concerts. They were talking about revenue and mailing lists and sound systems. They said you had to be careful because you’d be bombarded with artists bothering you all the time. We didn’t belong there. Effective cultural organizing for social justice begins small, with the individual. First, one discovers his or her own truth of an issue, and then tests and develops that truth in dialogue with others. When this individual and collective learning process is multiplied, a national movement for reform develops and changes society. Such a movement can only be sustained when this grassroots process of individual and collective learning continues to inspire awareness and shape the actions. This theory of change emphasizes that those who directly experience a problem must make up the generative base for devising and enacting the problem’s solution. The question is not whether you have privilege; the question is what you are doing with that privilege. We didn’t ask to be born in whatever situation we were, but we can choose what we do with the resources that are available to us. I’m not saying you should go spit in the master’s face and give up your job. But if you’ve been working in the kitchen and it’s been three months since you threw some food out the window, there’s something wrong. I’ve been part of starting a handful of national organizations committed to cultural equity and social justice, only to see the leaders and membership get distracted with careerism and other personal agendas that were divergent from the organizations’ founding purposes. There are a lot of people who want the cream without committing to the churning, and ethical issues can quickly ensue. Sustaining an ethos in which we help each other stay accountable is definitely a challenge for this field. Some of us are working on issues of justice, equity and freedom for our communities, and some of us are just doing art, and there’s a difference. We need to clarify the language that we use to define what it is we’re doing. I’ve never been about the art. The art conversation has always limited our possibilities, especially given the structures of funding. It’s never been about the art, because I always knew that there were great artists in our communities. It has been about providing voice to the issues. It was never the goal to have artists hanging at the Metropolitan, and it was never a goal to develop institutions that were mini Mets, Black, Latina or Asian Mets. That was never our goal! But it was the goal for some. One reason identified for the lack of ethics and personal accountability among many of the art and social-justice organizers and organizations was insufficient field-wide critical discourse. Participation of young people and community members was of paramount importance to the forum methodology. As the founders of cultural arts organizations surpass 30 years of service, the next generation will need to lead, bringing 21st century realities to the forefront. There was a call not to dilute the analysis for the sake of young activists or community members. For example, when planning one of the forums, there was an initial resistance among some of the local leaders to using the economic analysis, believing their constituencies wouldn’t understand how the heady analysis related to the immediate issues facing them. As the participants’ subsequent stories about negative stereotypes in the media, gang violence, injustices in the prison system and the need for immigration reform illustrated, they were quick to see how their issues were impacted by hyper-capitalism. In planning each of the Voices’ national conversations, one constant challenge was getting agreement to shift from a passive conference format to an action oriented organizing format. Typically, it was suggested the event be organized around a panel of experts. In the spirit of ethnomusicologist Alan Lomax, who coined the phrase cultural equity in his 1977 Journal of Communication essay, “An Appeal for Cultural Equity,” and whose groundbreaking work stood for the inherent genius of every cultural community, every person in a Voices forum was expected to fully participate. The Voices format emphasized that all the knowledge needed to take the first action steps was in the room. Initiating actions to advance cultural equity in participants’ home communities was an important focus in all of the forums. The idea was that a series of local actions would become the basis for a national movement, and that a renewed and vital national critical discourse would fuel and support these local efforts. 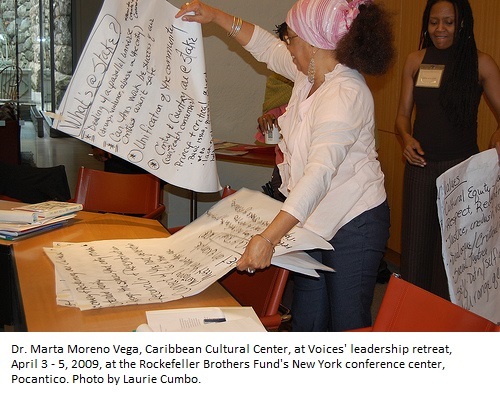 To date, the most developed local action is Marta Moreno Vega’s Cultural Equity Group (CEG). 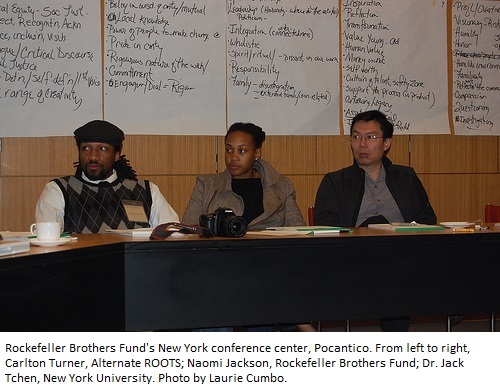 After the June 2007 conference, Vega, equipped with the Voices ’economic analysis, began arguing publicly that the Department of Cultural Affairs’ new funding structures weren’t responsive to communities of color. “It’s a class issue as much as anything else,” she said, “because most of the institutions in our communities don’t have access to wealth” (Lee). Vega began organizing a coalition of cultural organizations and artists in New York City (including Association of Hispanic Arts, Bronx Council on the Arts, Harlem Arts Alliance, Children’s Art Carnival, Asian American Arts Centre, Museum of Contemporary African Diasporan Arts, among others) to advocate for the equitable distribution of funds and other resources to under-resourced and underserved emerging and midsized organizations grounded in the culture and arts of their communities. The objective of CEG was to stabilize its field, providing necessary technical assistance and program management resources to assure the growth of its member organizations. It wasn’t long after getting organized and going public (among other media, The New York Times published a CEG story on July 24, 2008) that coalition members began getting push-back from New York City officials and funders, including thinly veiled threats to rescind their grants. Under this pressure, several organizations dropped out of the coalition. Mindful of the veteran activist adage that you’re not engaged in the struggle until meeting resistance, Vega proposed a national intervention: offer training for young arts activists to prepare them for their confrontation with power. The 2007–2009 round of national forums helped clarify present circumstances, including the external forces and policies derailing the national and global movements to achieve cultural equity as a fundamental human right. The forums also revealed how these external forces and policies, which had delegitimized the cultural-democracy movement, had weakened and, in some cases, corrupted the movement’s internal critical discourse upon which its accountability and its goal of cultivating new leadership depended. On April 3-5, 2009, 26 Voices leaders met at the Rockefeller Brothers Fund’s New York retreat center, Pocantico, to reflect and plan. They concluded that the analysis Voices had developed over the previous two years had restored the coalition’s vitality, surfacing the most pressing issues for it to address: laying the groundwork for new knowledge production about the theory and practice of cultural equity; developing a way to bring a new generation of leaders to the intersection of art, social justice and cultural equity; and preparing for the debates about cultural equity and policy which, as its leaders had predicated in their 1993 publication, were now taking shape locally, regionally, nationally and globally. Especially given the recent trend among colleges and universities to develop programs linking art and community engagement, Voices leaders thought it important to examine the role of the academy in knowledge production related to issues of equity. Had higher education become part of the system that was putting profit before people and community? Did the academy play a role in the movement’s loss of its critical discourse, and what positive role could it play restoring the discourse? The September 2008 research report, “Culture and Community Development in Higher Education,” written by Arlene Goldbard on behalf of a team of researchers and advisors, highlighted some of the barriers obstructing college and university knowledge production in service to cultural equity, including a fundamental uncertainty on the part of the academy as to whether community knowledge should be respected and integrated into academic programs (Goldbard 38). The report makes a series of recommendations, the perhaps most important for the purpose of this essay being: “Community cultural development [programs] in higher education should have an explicit goal of supporting and developing the field beyond university walls” (55). Several ideas for improving knowledge production have emerged from the forums and the April Voices leadership retreat: 1) Organize higher education consortia to advocate for cultural equity. 2) Ask colleges and universities to manage an interdisciplinary discourse linking economic, political and cultural analysis as a way to understand the cultural history of the past 30 years and to describe a way to move forward. 3) Develop a “university without walls” in order to respect community knowledge, welcome a diverse faculty and student body, be cost effective, encourage peer-to-peer learning, utilize technology, develop the job market and advocate for the field. To empower the next generation of activist artists, some of the young leaders in Voices are focused on analyzing the movement’s recent history and progress in order to find a strategic way forward. They are asking: What are the assets and deficits young activists are inheriting from the movement? What strengths and weaknesses do young activists bring? To ripen their analysis, they are proposing that a group of veteran social-justice and human-rights leaders, drawn from different fields and sectors, be invited to share their insights, which then would be probed by the coalition of new leaders in order to formulate an advanced strategic plan of action. At the invitation of the National Association of Latino Arts and Culture, on May 7, 2009, Voices leaders traveled to the White House to meet with Obama administration officials including Kareem Dale, special advisor to the President and White House arts and culture liaison; Stephanie Valencia, White House Office of Public Engagement; Yosi Sargent, National Endowment for the Arts communications director; and Jodi A. Gillette, deputy associate director of the Office of Intergovermental Affairs. They discussed existing cultural policy as well as promising opportunities for artists and cultural activists to help revitalize communities. The White House staff members were attentive during the discussions and affirmed that this meeting would be the first of more meetings to come. Voices leaders will discuss their take on administration policy at the Grantmakers in the Arts conference in Brooklyn, N.Y., October 18-21, 2009. To avoid high university overhead charges, establish a national fiscal agent for campus-community projects. Develop a cultural-equity/social-justice audit for campuses. Given the increasing interest in community service and activism among teenagers, a ranking of the top institutions for social justice would serve as a recruitment tool to advance our field, as well as link arts students to other activists. Build a coalition of community arts students, alumni and new and veteran practitioners. Have local chapters on campuses, linking local to national and international networking. Such a “Community Arts Students Union” could be effective for sharing job opportunities and for rallying change at universities. Create opportunities for young people to reshape existing material about cultural equity and disseminate it in new forms of media. Creative Commons and Open Source were discussed. To resist fragmentation, collaborate more within our field and across sectors — for example, with the sustainability movement. Get back the taxpayers money — our money — to build our communities. A full report of this CACRP session will be published in February 2010 in Community Arts Perspectives (Volume 2, Issue 7). For the foreseeable future, Voices will continue to provide a platform open to all to discuss cultural equity, art and social justice. Only time will tell whether there will be sufficient commitment to maintain the critical discourse and develop the cultural policy necessary for the emergence of a global pluralism that deeply respects local life and its tradition bearers, which is the goal of Voices from the Cultural Battlefront: Organizing for Equity. Jamie Haft is assistant director of Imagining America: Artists and Scholars in Public Life, where she is organizing its Presidents’ Council and creating programs that bridge higher education and grassroots arts and cultural organizations. Transcribed by the author from a StoryCorps audio recording between Amalia Mesa-Bains and Tonya Gonnella Frichner, recorded on June 8, 2007, and available at http://culturalbattlefront.net/Pages/Audio.html. Transcribed by the author from the audio recorded at Voices’ forum at the Folk Alliance International Conference in Memphis, Tenn., on February 21, 2009. First articulated in his article, “Theory of Change,” published on August 29, 2006 at http://roadside.org/Theory.of.change.html. Dudley Cocke updated his theory of change in a conversation with the author on June 26, 2009. Transcribed by the author from the audio recorded at Voices’ forum at the National Performance Network in New Orleans, LA on December 6-7, 2007. Transcribed by the author from the video recorded at Voices’ anniversary conference at New York University in New York, NY on June 8-9, 2007. Transcribed by the author from the video recorded at Voices’ forum at the National Performance Network in New Orleans, LA on December 6-7, 2007. Marta Moreno Vega conversation with the author December 20, 2007. Jamie Haft. “Article: Voices from the Battlefront: Achieving Cultural Equity Through Critical Analysis.” https://roadside.org. October 22, 2015. https://roadside.org/asset/article-voices-battlefront-achieving-cultural-equity-through-critical-analysis.